Their finding, published in the journal Nature Communications, is another step toward answering the question of how lightning begins. 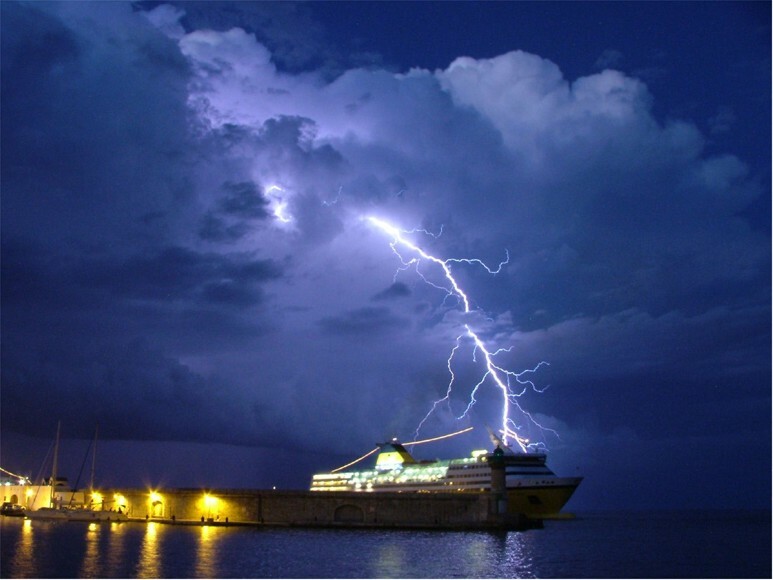 Recently, the problem of lightning initiation seemed to be solved with the discovery of “fast positive breakdown” of air, which matched the theory long held by lightning researchers. Fast positive breakdown involves the downward development of a pathway in the cloud, moving from the positive charge at the top of the cloud to the negative charge in the middle of the cloud. The pathway forms at one-fifth the speed of light and can trigger lightning. However, the newly reported observation of fast negative breakdown shows that an upward pathway—going in the opposite direction and just as fast—can be created in a thundercloud, indicating there’s another way to start electricity in the air. Ultimately, this provides scientists with a new view of what’s possible inside a storm cloud. “These findings indicate that lightning creation within a cloud might be more bi-directional than we originally thought,” said Julia Tilles, a doctoral candidate in the UNH Space Science Center. The paths aren’t straight due to variations in electrical resistance, i.e. the step leaders look for least resistance. An analogy would be water flow of rivers, but vastly speed up. Click on the blog pic – the lightning paths look a lot like a river with tributaries. The first two (nos. 10 and 9) are related to lightning. oldbrew, way back in the dim and distant past I was taught in my physics class that the current path in a lightning strike was from ground to clouds. Is that the answer you were looking for in your first post? ivan – the visible evidence seems open to that interpretation, yes. How lightning initially forms is still a matter of debate: Scientists have studied root causes ranging from atmospheric perturbations (wind, humidity, and atmospheric pressure) to the impact of solar wind and energetic particles. In an average thunderstorm, the energy released amounts to about 10,000,000 kilowatt-hours (3.6×1013 joule), which is equivalent to a 20-kiloton nuclear warhead. A large, severe thunderstorm might be 10 to 100 times more energetic. Where does all that electrical energy come from? I tend question that. I have twice seen the effect on a carob tree. No different than what I once did with half a stick of dynamite. If there is that amount of energy, then where is most of it released? Light energy, -yes- , a fair amount which as I’m suspecting, drives a pulse from the solar panel inverters enough to trip all the ELCB in the vicinity. An average bolt of lightning carries a negative electric current of 40 kiloamperes (kA) (although some bolts can be up to 120 kA), and transfers a charge of five coulombs and energy of 500 MJ, or enough energy to power a 100-watt lightbulb for just under two months. The whole thunderstorm is obviously a lot of those. Catatumbo lightning phenomenon mysteriously disappeared for months in 2010. For a several months starting January 2010, not one lightning bolt was seen, sparking concern it was gone forever. Then, as mysteriously as it had stopped, it began again, as proven from NASA satellite data. There are lots of theories on why the lightning stopped and then started again. The last time the phenomenon vanished was in 1906 after a catastrophic 8.8-magnitude earthquake off the coast of Ecuador and Colombia unleashed a tsunami. The lightning returned three weeks later. • First predictability study of lightning density rate at seasonal scale. • Most seasonal lightning activity in the Lake Maracaibo Basin is related to a highly predictable regional mode of variability. • Predictive skill is higher than typical values for rainfall amounts in the region, and it is similar for winter and autumn. Pilots whose helicopters have been hit by lightning have reported there was no sign of it present in the area before they were struck. Forecasters now know the negatively-charged helicopter acts as a conductor for the lightning, aiding its passage to the earth. The CAA has received notification of six lightning strikes on offshore helicopters since 2010. This is a form of ‘triggered lightning’. A very good question to which I would add can we harness it in a useful way? In fact it would be a good research project for all those chasing ‘pie in the sky’ battery enhancements. If they cracked that it would put all the toy bird mincers out of business and save the various countries power grids from being destroyed. In meteorology, convective available potential energy (commonly abbreviated as CAPE), is the amount of energy a given mass of air (called an air parcel) would have if lifted a certain distance vertically through the atmosphere. CAPE is effectively the positive buoyancy of an air parcel and is an indicator of atmospheric instability, which makes it very valuable in predicting severe weather. It is a form of fluid instability found in thermally stratified atmospheres in which a colder fluid overlies a warmer one. An air mass will rise if it is less dense than the surrounding air (its buoyant force is greater than its weight). This can create vertically developed clouds due to the rising motion, which could lead to thunderstorms. There is also discovered recently 27 day cycle in regular activity level of lightning. The postulate is that solar winds influence its activity, relative to the frame of reference the earth is in, thus 27 day turns of the sun corresponding to 27 turns of the earth, some how influences, the activity of thunder. But this result is only valid over large area. I believe the tracts the thunder runs through, at discharge are influenced by solar winds and the cosmic rays. there are many more article related to this phenomenon.